I’m so excited to share this recipe with all of you today due to my new found love of persimmons! Have you tried them? They’re fantastic and definitely my new “it” fruit of the season! 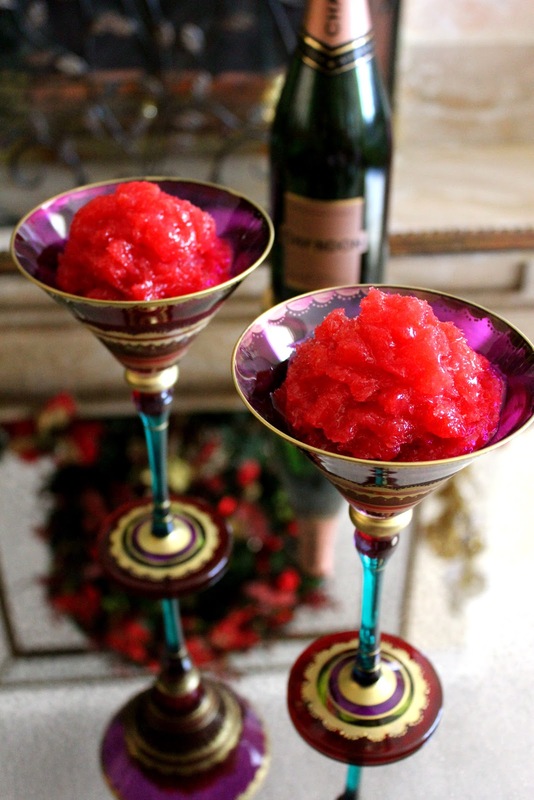 Earlier this week I already had it in my head that I was going to make champagne granita for NYE. It’s the perfect dessert for the occasion, light, quick to put together, and boozy! Originally I planned to use blood oranges, but after striking out on a mission to find them, I was introduced to the lovely persimmon. After sampling the persimmon, I was immediately enamored. I picked up a few, grabbed some raspberries, and quickly got to work. Persimmons look like orange tomatoes, are deliciously sweet, and remind me of mangos in both taste and texture. After a quick trip in the blender, they yielded a very thick puree the way mangos do. At this point I was a bit worried. See the reason I would normally use blood oranges in granita aside from phenomenal flavor, is that they yield a very thin juice which freezes beautifully and gives the granita an icy consistency. A thick puree that is naturally very sweet might not freeze very well, but you don’t know until you try, right? I continued along making my simple syrup, and pureeing my raspberries. 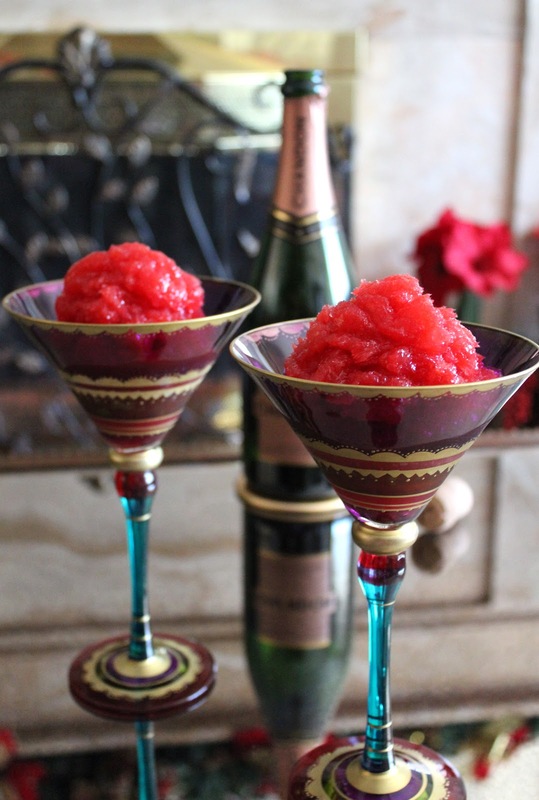 I also want to mention that I used frozen raspberries for this. I normally don’t use frozen fruit, but I wasn’t loving the way the raspberries looked. I tried Green Way organic raspberries and was really happy with them. I’m really funny about frozen fruit, but this brand was awesome, and I’ll definitely be using them again. Okay so I whisked both my purees, simple syrup, and juice of a lemon together in a big bowl. Next I popped a bottle of dry champagne, and added that to the mix. I separated the mixture into 3 small containers so it would freeze faster, popped them in the freezer, and said a little prayer. The next morning, to my surprise, it froze! I scraped the sides with a fork, and gave it a few more hours to set up. The end result was fantastic. It definitely has a thicker consistency than my usual granita and needed a little extra freezer time, but that’s okay, it was worth the wait! The flavor is lovely, the champagne really cuts the sweetness of the fruit beautifully. The color is just brilliant, kind of looks like a party in a glass. I’m really happy it all worked out, and I can’t wait to create more desserts with persimmons. I hope you all have a fantastic weekend, and Happy New Year! Make a simple syrup by bringing the sugar & water to a simmer. Set aside to cool. Puree raspberries and strain. You can also sub strawberries. Puree persimmons. You can sub blood oranges here. Stir all ingredients together in large bowl. Transfer to a container & freeze. I used 3 small containers so it would freeze faster. I recommend scraping the granita 2 -3 times during the freezing process. Recipe yields 3 & 1/2 cups liquid. Using persimmons led to a longer freezing time. Using a citrus that gives a thin juice such as blood oranges will freeze much quicker. You can easily adapt this recipe to fit what fruits & puree you have on hand. I cannot get over how pretty this is!!! I totally want one right now. Hi! I was just wondering which persimmon you used? Whether it was Hachiya’s or Fuyu etc?